Reform movement takes 40% of American delegates' seats as Conservative, Modern-Orthodox slip; two new parties represented. 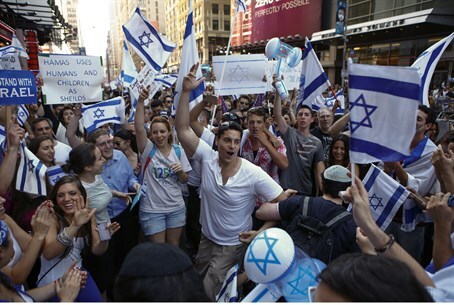 Pro-Israel rally in New York - but are all American Jews this passionate? Results are in from the hard-fought elections to the 37th World Zionist Congress, with 56,737 votes counted after polling - which began way back in January - closed in April. 500 seats were up for grabs, with 145 for delegates from the United States - the largest Jewish community represented after Israel, whose 190 seats are not elected directly in the WZC but simply allocated in proportion with the numbers of seats held by the respective factions in the Israeli Knesset. The elections were a victory for the American Reform Movement, represented by the ARZA: Representing Reform Judaism party, which maintained its 56-strong showing from the last congress, making it the largest single faction with some 40% of the American vote. In contrast, the Mercaz (25 seats) and Mizrachi/Religious Zionists: Vote Torah for the Soul of Israel (24) parties - representing the Conservative and Modern-Orthodox movements respectively - lost a combined 18 seats. Still, it means that the three major religious streams in American Jewry hold 70% of the American delegation's seats. Two newcomers - the World Sephardic Zionist Organization - Ohavei Zion and the Alliance for New Zionist Vision - picked up 4 and 2 seats respectively. HATIKVAH - The Progressive Zionist Voice (8), Zionist Spring (7) and the Zionist Organization of America (ZOA) (7) also gained seats. Also represented on the list: American Forum for Israel (10); Green Israel: Aytzim/Green Zionist Alliance/Jewcology (1); Herut North America - The Jabotinsky Movement (1). The American Zionist Movement (AZM), which represents the coalition of Zionist groups in the World Zionist Organization, lauded the elections as a successful expression of the will of American Jewry. "The World Zionist Congress is the single best opportunity for American Jews to have its voice heard on critical issues facing Israel and the Jewish People, and the voice has spoken” said AZM President Rabbi Vernon Kurtz, President of the American Zionist Movement. The World Zionist Congress is now set to meet again this fall, for the first time since 2010.